If you notice your garage door is coming off its tracks, do not attempt to repair it yourself. Garage doors are heavy and can be dangerous when they drop unexpectedly. A garage door technician has the experience to safely repair your garage door so it’s no longer a hazard. While you won’t be able to fix a garage door coming off its tracks by yourself, it’s still important to know what caused the damage so you can prevent it from happening again. One of the most common reasons for a broken garage door is that someone drove into the door with their car. This can happen when people are in a hurry and don’t check to see that the garage door is up before backing out. The bottom of the garage door can also become damaged if someone doesn’t wait for the door to come up all the way before pulling in. When you look at a crumpled garage door, it’s easy to assume that the damage is superficial. However, a car doesn’t have to be moving fast to cause damage to the entire garage door system—perhaps only 3 to 5 mph. When the car crashes into the garage door, the impact is enough to knock the rollers off their tracks. If your garage door is hanging precariously in the balance, the best thing to do is to get out of your garage and call the company that installed the garage door system. If you can’t remember the name of the garage door installation company, try to look for their sticker on either the garage door opener on the ceiling or the door itself. If the garage door tracks move slightly out of alignment, it might be because the horizontal tracks were made out of an inferior material. If this is the case, the horizontal tracks slightly bend under the weight of the garage door, eventually causing misalignment. Tracks can also misalign when the bolts holding the track in place become loose. When this happens, the vibrations from the door going up and down are enough to push the tracks out of alignment. When the tracks are no longer parallel to each other, the rollers roll right off the tracks. Once this happens, you’ll need a garage door repair contractor to get your garage door up and working again. Like the name suggests, the rollers are responsible for rolling the garage door along the tracks. However, when these rollers become worn or broke, they aren’t able to support the weight of the garage door anymore. Garage door rollers can wear out prematurely when the garage door is opened and closed excessively or the rollers are made of low-quality material. When one roller breaks, this puts more pressure on the remaining rollers and can even warp the tracks. It’s rare that a broken lift cable will be the reason your garage door comes off its tracks. 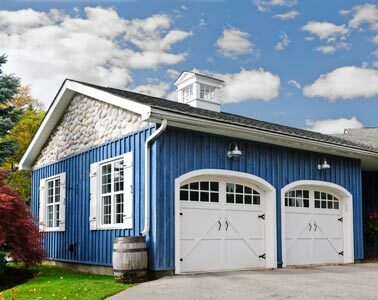 However, older garage doors that haven’t been serviced in years are more at risk. When the lift cable snaps, it shifts the weight of the garage door onto the other lift cable. Since the weight of the door is distributed unevenly, this causes one side of the door to stay open while the other meets the ground. This unbalance is enough to pull the rollers off the track. One way to prevent garage door repairs is to make sure you get your garage door serviced once a year. While many homeowners believe that they’ll always be able to tell if repairs are needed, this simply isn’t the case. Only a garage door repair technician will be able to check the intricate mechanisms of your garage door to ensure everything is in working order. Regular garage door inspections ensure that small issues are resolved before your garage door comes off its tracks. Most homeowners use their garage door several times a day, which is what makes garage door maintenance so important. Scheduling a garage door service visit every year is your way of making sure your garage door will always work when you need it to. The garage door installers at Abode Building Center are dedicated to helping clients restore the function and appearance of garages. If you are interested in learning more about our garage door installation and repair services, give our Portage building contractors a call at (269) 329-1800.